Communication is essential in building a doctor patient relationship, creating trust and establishing loyalty to treatment. In order to get a clear overview of the different phases in doctor, patient and family communication a framework was created. To facilitate more continuous communication between the preparation phase and the consultation a design called Polly was created. 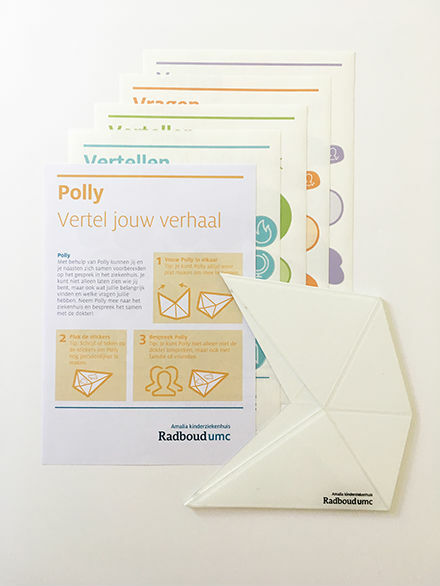 Polly is a tangible tool that is sent to the patient prior to the doctor consultation. It gives child and family the opportunity to prepare for the consultation together at home and thereafter discuss it with the doctor. A field research in which the design Polly was used, was conducted at the Amalia Children’s Hospital. The pilot study explored how design can influence the preparation of and the communication during the consultation. Results showed that Polly gave suggestions on how to prepare for the consultation. Moreover, Polly empowered the patient and family in recapitulating this preparation and expressing this during consultation. It was found that Polly was especially helpful in expressing more personal and less medical issues and empowering the child. This study showed that Polly has the potential to bridge the gap between patient preparation and consultation. Further research is needed to explore these findings. In doctor consultation many elements need to be discussed, actions need to take place and different perspectives need to be taken into account in limited time. In consultation conflicts of interests can be found. In general the doctor swiftly wants to reach a diagnosis or solution for the patient, counsel and establish a relationship with the patient. The patient and family mainly aim to express the story and consequences of the patients’ suffering and want to get a solution. In pediatrics, the patient often focuses more on short term goals, such as when can I play soccer again, whereas parents or family focus more on future aspects of the illness. An appropriate doctor, patient and family communication takes all these perspectives into account and they all are experts in different areas. Therefore different participants of the consultation should take the lead in different areas. In order to structure this consultation and contribute to the agenda of the pediatrician, it is important for patient and family to prepare and express this preparation. Good communication also contributes to patient experience of care. Patient experience of care has become more important and a guiding factor in today’s healthcare. Patient experience is more than patient satisfaction, in this a more personal approach is embedded to fit the needs of patients and engage them in their healthcare decisions. A new communication framework is proposed in order to create a more continuous and long-term communication. A design was created to find whether elements of this framework could be brought to doctor consultation. Design has the potential to play a role in the communication framework as described and to create a more long-term and continuous communication. For this paper it was chosen to explore if a design could play a role in the hand-over phase. Guiding the patient and family through this phase may have an effect on the other phases as described in the framework. In order to help patients and family prepare for a consultation and make them more involved in their own care a design called Polly was created. 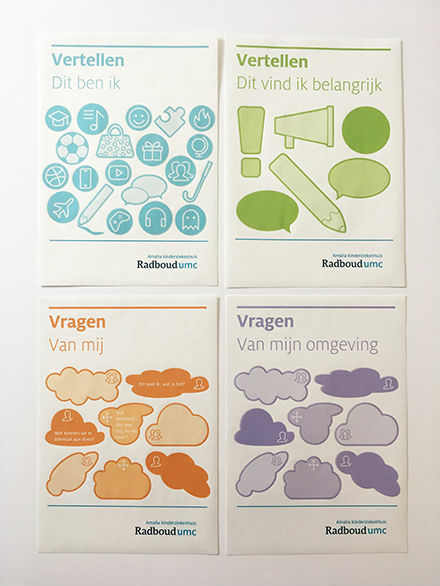 The design consists of a tangible tool, explanation sheet and four sticker sheets that can be placed in an envelope and send to the patients their homes. When patients receive an invitation for a hospital consultation they also receive Polly in the same envelope. Polly invites patient and family to discuss the upcoming consultation together at their home environment. The completed tool can be packed and brought to the consultation. There the different sides of Polly can be discussed together with the pediatrician.